The original effect, in Annemann's own words, was as follows - " It made use of a Yale or Corbin padlock and seven keys, only one of which would fit. The keys were to be mixed and each of seven people would pick one out and hold it in their closed fist. The performer would now pass from one to another and finally stop in front of one whose key would be tried and found to open the lock." The effect has since become very popular with magicians. From simply divining which key would open the lock the effect has evolved over the years to one where the performer now has total control over which key will work. The original routines involved the use of ordinary padlocks and keys, and a switch of the useable key with a dummy. Gimmicked locks followed, allowing you to handle the props in a much cleaner manner, with more scope for the presentation routine. The lock we give you is one of the best. The original Annemann effect would be easy to perform with this prop - just pick any spectator! It is also a great prop for a "Jackpot" type effect, which can be adapted for virtually any type of audience, from kids to adults. 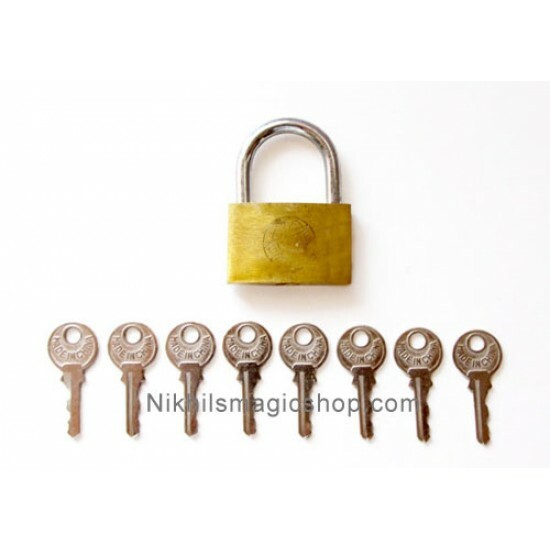 This is a regular Padlock, but gimmicked in a most ingenious manner, along with several keys. Any of these keys can be "controlled" by the performer to open or not open the lock. It does not matter whether the performer or a spectator tries to open the lock, it will open or not open when handled as described. Comes completely ready to work with instruction sheet. This trick can be mastered in five minutes or less. Children age ten or older should be able to perform it reliably. A story line is provided in the d..